Welcome to our eighth episode of the Nation podcast. On this episode, we do a follow up in a sense to the ending conversation from episode seven. To hear what was discussed on the show, http://9thmannation.net/?p=516 listen to the show again here and make the connection on what brings us to this episode. 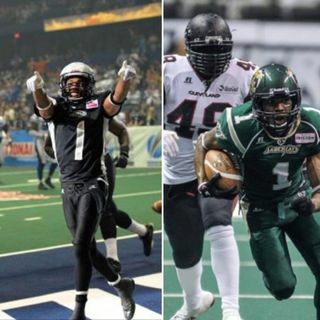 Our guest on this show is former wide receiver from both the Chicago Rush and the San Jose SaberCats, plus the reigning ArenaBowl XXVIII MVP, "Big Play" Reggie Gray. We sit down ... See More with Reggie, via Skype and his home in Chicago, to discuss his personal experience of first trying to get on a roster for an AFL team. He then continues the conversation with his experience of finally getting on the Chicago Rush both prior to the one year hiatus and after. In addition, Reggie talks of finally playing for a team that he once truly hated, but respected, and away from his home city of Chicago, San Jose SaberCats.